When the thermostat light (Emergency Heat Light) is flashing or on during normal operation (whether in the cooling or the heating mode, but not the Emergency Heat mode), this usually indicates that the outdoor unit is "locked-out". This means the outdoor unit has shut itself off because of a problem, and it sends a signal to the thermostat, letting you know that there is a problem. When this happens, the indoor unit tends to keep on running because the indoor unit doesn't know there is a problem. And if the outdoor unit isn't running, the indoor unit will most likely never satisfy the thermostat; it will just keep running and running and running. 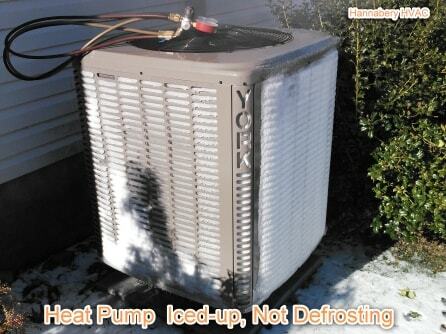 Many systems, like the York Stellar Series units have a diagnostic feature. When you see the light flashing, it flashes a code. You can count the number of flashes, usually between two and nine, and then it just repeats itself. You can then reset the system by turning the thermostat "off", waiting thirty seconds then turning it back on again. This should restart the system, but it may take up to 10 minutes for the outdoor unit to start up. Some systems require shutting the power to the indoor unit off momentarily, then back on. The light should also go out. After 10 minutes, see if the outdoor unit is running. If the light doesn't go out or if the unit doesn't start, you may need to call for service, assuming you checked for the obvious; like tripped breakers or the outdoor reset button. Sometimes a unit will "lock-out" on a fluke or a weather-related condition, and resetting it will solve the problem. But if the unit "locks-out" again, most likely there is a problem and you should schedule a service-call. Defrosting too much (weather conditions related) - possible cause: outdoor unit in a snow-drift or covered in ice.